As the Omega Men and Supergirl battle the genetic clones. Kara tries to prevent them reaching the outpost using the axe she stole from Rogol Zaar despite knowing it amplifies rage. Ryand'r's solar power helps but the battle is a dangerous one. Even trying to reach out to her sisters doesn't seem to overcome their rage. Z'ndr and Krypto are soaring through space in the escape craft looking for signs of Kara and it's only by pure luck that Krypto notices a very weak signal on the video screen and the duo set a course to rejoin their friend. Back on the Omega Men's ship Kara asks Ryan'dr for a power boost and he obliges in his own unique way and the backlash causes their unstable genetics to collapse in literal piles of goo. Kara swears revenge and takes the fight directly to Hokum. Kara snatches Appa's ring as Hokum is teleported away to safety and investigated the ship making a horrific discovery. Kalista tells Kara that their friends that Hokum experimented on have survived but will remain in stasis until they can be cured. Ryand'r also gives Supergirl a parting gift - her superpowers at maximum strength just in time for Z'ndr and Krypto to reunite with them. Hokum finds himself at the mercy of Lord Gandelo who shows no mercy to the deranged scientist. Gandelo teleports Hokum into deep space and watches him suffocate. Gandelo holds a holo-conference with the Rannians and Thanagarians revealing that Supergirl knows the truth about The Circle. They insist Rogol Zaar has gone rogue but they all risk exposure if Supergirl reveals what she has seen. Gandelo sends an order to Rogol Zaar's planet, R'Venna, with an order to kill Kara Zor-El and the entire planet swears to continue Zaar's work. Story - 5: It's been a long journey for Supergirl already and as much as I'm enjoying her side of The Circle and Rogol Zaar mystery the real scene stealers are Z'ndr and Krypto. They have stolen every scene they are in and I love the fact he can understand everything Krypto says. I really want more scenes with them because they also provide some light to what is proving to be a very dark storyline. I feel like the Omega Men haven't had as much of a chance to shine in the arc as they could have, so it will be nice to have them be more prominent in the DCU from now on. 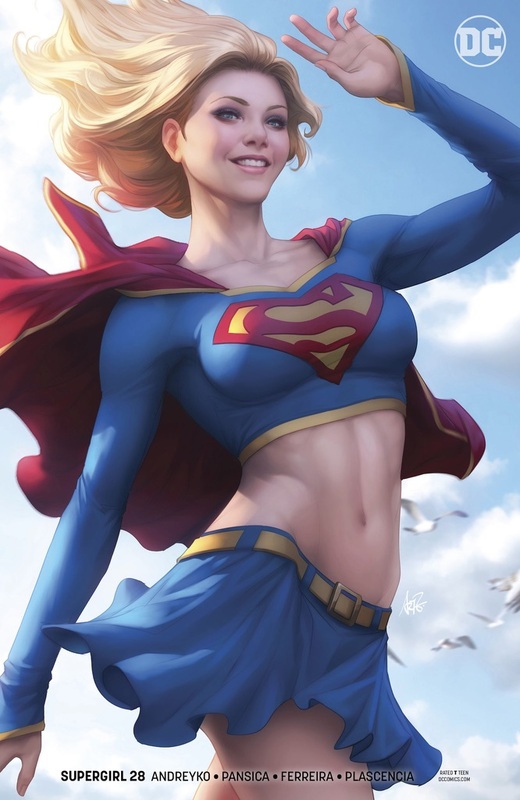 With how much Kara's story arc is developing I am wondering how it will match up with Superman and Action Comics, but it is equally enjoyable that Kara is a powerful force on her own and I hope Andreyko sticks around beyond this arc. Art - 4: Love the art this issue but my only issues are that the two big splash page scenes weren't of the action sequences but rather the supercharged kiss and reuniting scene. Both look great but as story beats I feel finally ending Hokum or battling the clones ought to have been the spotlight. 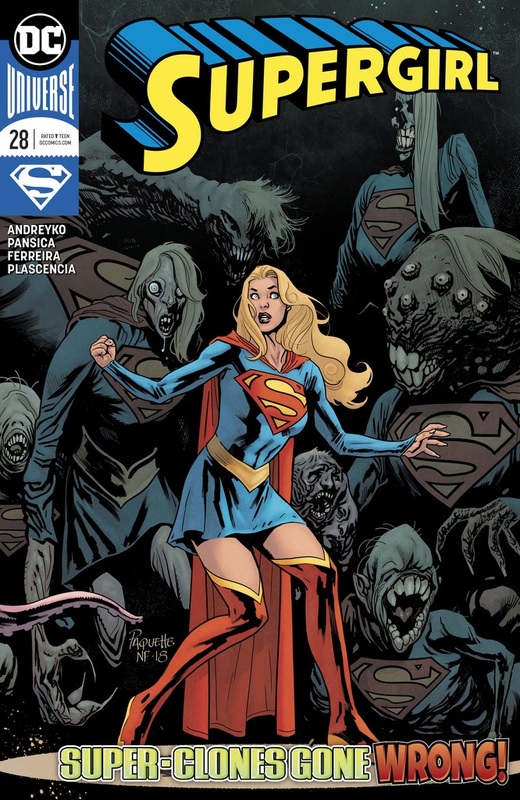 Cover Art - 5: Paquette puts a macabre twist to the Supergirls clone theme we've seen a few times before. The creatures have a warped look that reminds me of the film Pan's Labyrinth and having Kara and the flow of motion just gives it that cinematic feel. Variant Cover Art - 5: Wow! Everytime I see an ARTGERM piece of art I find myself in awe of how stunning they are. Kara has never looked better!